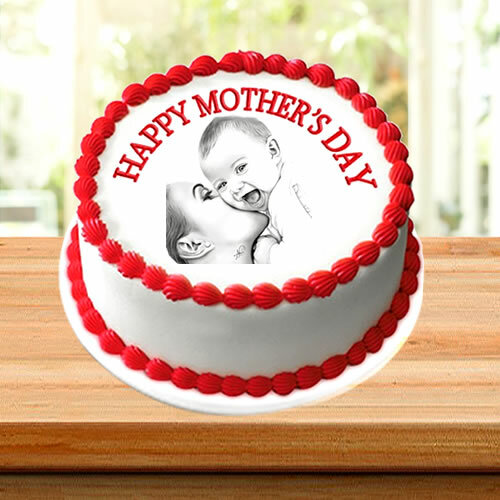 This photo cake can easily charm your mom this Mothers Day… The photo of your choice or your moms choice on this delectable cake will just add the right touches of love…A delicious Personalized Photo Cake is a perfect gift for any party host! This cake will be personalized with your image, the Photo is printed on the top of the cake with edible inks and is 100% safe. Surprise your loved ones with a personalized cake. Get your picture printed on half kg cake. Treat your mother to something extra special this Mother’s Day. Flavor: Pineapple by default you can change cake flavor as per requirement. On this mother’s day, make your mother feel extra special by surprising her with something unique like a delicious cake. Send mother's day cake to your Mommy and let her know how much you care about her even though when you live far away from her.